It was another super performance from Annan as they pushed St Mirren all the way in this highly entertaining and exciting Petrofac Training Cup Tie. The game was a cup classic which had the fans of both teams on the edge of their seats throughout. Annan got off to a flier with Weatherson scoring from the penalty spot inside a minute, the lead was held until the 51 minute when the Buddies equalised through Jordan Stewart with Alan Gow scoring the all important winner in the 66th minute. Annan pushed hard for the equaliser but St Mirren held on for an important victory to reach the Quarter Final stages of the cup. St Mirren kicked the match off and immediately lost possession, as McColm darted to the edge of the box he squared the ball to Josh Todd who was upended by Jim Goodwin and the referee pointed immediately to the penalty spot – time 16 seconds. Weatherson converted the spot kick right up the middle and past Jamie Langfield. Jodan Hart was called into action when he pulled off a good save low down from a well struck shot from Howiesons effort in the 7th minute as the Buddies went out to avenge their earlier set back. The referee brushed aside claims from St Mirren when Jordan Hart and Jordan Stewart collided on the edge of the box with Hart Punching the ball to safety. Stuart McColm squandered a golden opportunity in the 15th minute to double Annan’s lead when he showed no composure skying over the bar from a very promising position. It was a real let off for the Saints and Langfield then pulled off a fine save to tip Josh Todd’s shot over the bar as the ball headed towards the top corner of the net. Lewis McLear then came close with a low raking shot in the 30th minute which went narrowly past Harts left hand post. Steven Sloan tried his luck on goal but his effort from the edge of the box in the 34th minute failed to hit the target. Jordan Hart pulled off a super save when at full stretch he denied Alan Gow pushing the effort for a corner kick as Saints pushed forward looking for the equaliser. Hart then tipped over Callum Gallagher’s header and as the game edged towards half time Lewis McLear’s low drive went agonisingly wide of the target. Josh Todd’s effort was tipped over the bar as Annan started the second half on the attack, this was followed by a Smart Osadolor effort which Langfield saved and moments later Rabine Omar’s effort flew over the bar. The equaliser arrived in the 51st minute and it was an excellent strike form Jordan Stewart whose 16 yard effort arrowed into the net through a ruck of players after the ball was only half cleared by the Annan defence. It was just the break that the Buddies were looking for but it did not deter Annan who continued to prod and test the Saints rearguard with efforts from Flynn and Weatherson causing anxiety in the visitors defence. With 57 minutes gone Annan had a great chance to equalise, Weatherson’s volley from Martin McNiffs header back across the goal brought out an important point blank save from Langfield and resulted in the keeper receiving treatment. It was to be a costly miss as Annan then conceded again in the 66th minute. The goal stemmed from when they lost possession on the edge of the St Mirren penalty box and a long ball was played down the right and Alan Gow’s low well placed shot form 15 yards beat Jordan Hart at the right hand post. Annan continued to create opportunities and in the 70th minute Smart Osadolor picked up Rabine Omar’s pass down the right and the striker made a bee line for the goal and he appeared to get caught in 2 minds electing to try and pick out Flynn instead of hammering the ball into the goal. It was a missed opportunity. Paul McMullen almost sealed the game in the 80th minute but Hart’s finger tip save was enough to divert the ball onto the post and towards safety. As the match entered the final few minutes Todd ballooned over from the edge of the box. Annan then forced several corners looking for the elusive equaliser but the Saints defended well. Langfield then pulled off a fine save to deny Weatherson’s well struck low free kick from 20 yards. 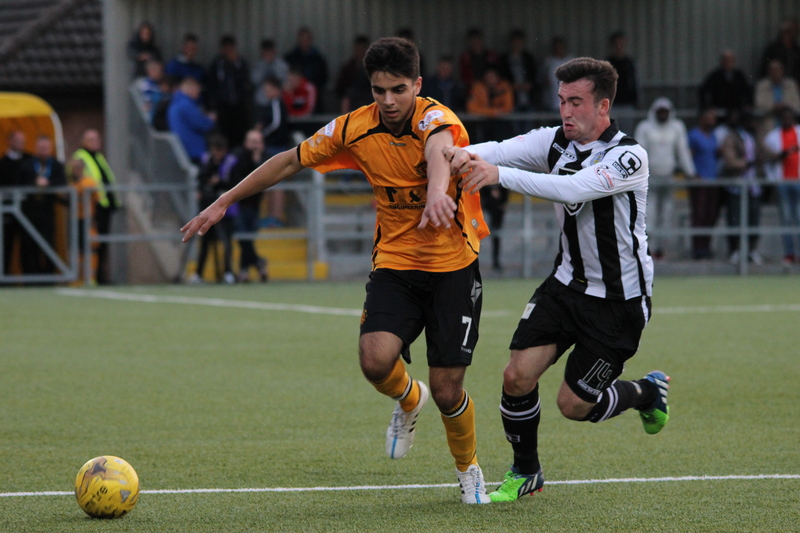 It was the final action in a great cup tie, Annan fought hard and St Mirren certainly knew they were in a match. For Annan the target is now to reproduce the form shown in the three cup matches in their league campaign . Annan Athletic – J Hart, S Black, S Swinglehurst, M McNiff, P Watson, S Sloan, R Omar, M Flynn (G MacDonald 83), P Weatherson, J Todd, S McColm (J Watson 83), S Osalador. Substitutes unused C Liddell, D Wadge, S Norman, B Wagner, B Currie. St Mirren – Jamie Langfield, Sean Kelly, Jim Goodwin, Alan Gow, Cameron Howieson (Lewis Morgan 87 min), Stephen Mallan (Scott Agnew 83 min), Jack Baird, Lewis McLear (Paul McMullan 68 min), Barry Cuddihy, Calum Gallagher, Jordan Stewart. Substitutes unused Mark Ridgers, Luke Conian, Stuart Carswell, Mark Barrowman. Referee – D Robertson Assistants- Colin Pensom and Joseph Lawson.